My best images of these very tiny mites are in this view. 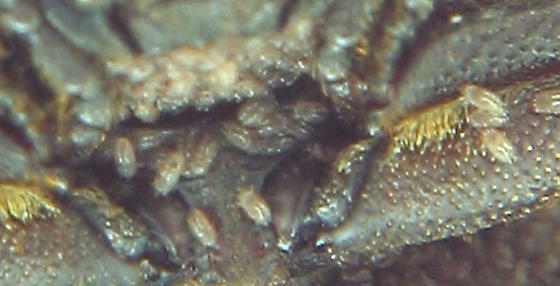 Very little detail, but maybe there's a specific mite that rides the Forked Fungus Beetle. I'll post a couple duplicates in bugguide's mites section. Were you able to learn anything more about these mites? I worked with several mite specialists in organizing the mites section of Bug Guide at one time but don't recall getting an opinion on these. It's been a while. I have seen nothing similar in Ecuador where I have lived and collected for the past 5+ years. Eleven years since the post, no less! Thanks for your response. Do you have a place online where I could see a photo of a favorite insect you've encountered recently in Ecuador?